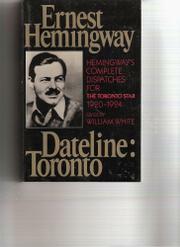 The complete (174) Toronto Star pieces young Hemingway wrote after his return from WW I on his second job as a writer. At 18, before going to Italy for ambulance service, he'd spent six months as a cub on the Kansas City Star. During his four years (1920-24) as a Toronto free-lancer, Hemingway found himself steadily in print. Meanwhile, he was writing widely rejected short stories (overarch and stilted) and after a stretch in Toronto spent much of his time on the Continent, sending back dispatches. Hemingway the feature-writer burned with a hard flame that turned clichés to ash and left only a glowing, often mordant wit and a robust sense of language. Whatever other sources Hemingway's news style may have had, Ring Lardner is the most obvious--there are several laugh-out-loud heartfelt but deadpan parodies herein, especially of sports writing: "We were fishing for the rainbow trout where a little river comes into a lake and cuts a channel alongside the bank. Into the mouth of this river and the bay it empties into, big schools of rainbow trout come out of the big lake. They chase the shiners and young herring and you can see their back fins coming out of the water like porpoises with a shower of minnows shooting up into the air. Every once in a while a big trout will jump clear of the water with a noise like somebody throwing a bathtub into the lake." Whenever Hemingway touches on sports, especially fishing and camping, he exhales poetry. Often, however, both here and abroad, he feels the need to give his reader the "true facts" about some social condition or political figure, and we hear the first tones of the Papa of later years telling us how it truly was. Everything in Paris seems to bring him to bright attention, for example the Russian exiles selling their jewels, while waiting for something wonderful to happen back home. "There is a cafe on the Boulevard Montparnasse where a great number of Russians gather every day for this something wonderful to happen, and to recall the great old days of the Czar. But there is a great probability that nothing very wonderful nor unexpected will happen and then, eventually, like all the rest of the world, the Russians of Paris may have to go to work. It seems a pity, they are such a charming lot." As the dispatches gather, Hemingway becomes more densely knowledgable and one feels the very forests, small towns, train stops and wayside inns yielding copy to the stroke of his fingertips. And then, in one of his longest pieces, there is the explosion of carnival and the running of the bulls in Pamplona, where young Ernest, in writer's heaven, is sad and acidulous and giddy with action, color, girls, and the dangerous bulls--"they come out into the glare of the arena to die in the afternoon." Birth of a style heard round the world. Like early Tolstoy, the guy had something.